A: I used to be a cyber-utopian. That view broke for me. I was teaching a class at NYU on social software. One of my students was a community manager for a magazine for teenage girls. They were shutting down the health and beauty boards because we can’t get the pro-anorexia girls to shut up with tips about how to avoid eating. I was thinking this isn’t a side effect of the Net. It was an effect. Ridiculously easy group forming for anorexics. Now, we have to move to a publish-then-filter world [filtering at the edges]. That pattern suggests we’re moving the media world from decision to reaction. We can’t stop the pro-anorexia groups from forming. All we can do is watch and act. A. My nightmare is that the advertising budget for print shrinks and we lose newspapers in mid-size American cities. We lose investigative journalism [that blogging doesn't replace a city beat reporter]. Every city under a million goes back to endemic civic corruption. The newspaper industry is not ready now to talk about how to save investigative journalism as we lose print. 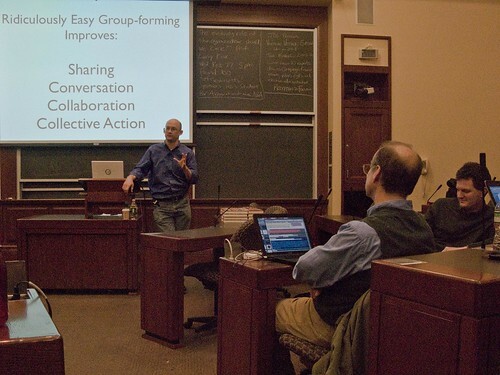 Shirky has a blog for his book and has several interesting podcast lectures out there.